Once upon a time a crow lived in a forest. Though he lived an absolutely satisfying life, he was always worried about his color. One day, the crow saw a swan near a lake in that forest. "This swan is so white. This swan must be the happiest bird in this world", the crow said to himself. The crow expressed his thoughts to that swan. The swan replied, "Actually I was feeling the same, until I saw a parrot. That bird has two beautiful colors, and now I think the parrot is the happiest bird." The crow, was now eager to see the parrot. The crow then approached a parrot and asked him how he felt about being the happiest bird. The parrot smiled and explained, "I lived a very happy life until I saw a peacock. I have only two colors, but the peacock has multiple colors." The crow then searched for a peacock. He found one inside a zoo. Plenty of people had gathered there to see the peacock. The children were excited to see the peacock. 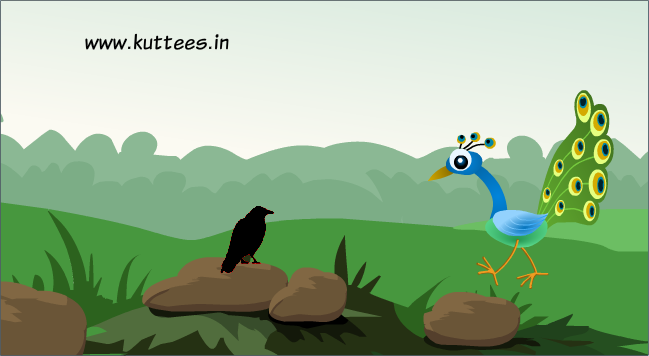 The crow now thought that peacock should be the happiest among all birds. When the crow told about this to the peacock, he laughed. The crow was puzzled to see the peacock laugh like that. Then the peacock replied, "Yes I am beautiful. Many people come daily to see me, but because of my beauty, I am locked inside a zoo. I have examined the zoo carefully and I have realized that the crow is the only bird not kept inside the cage here. So, I can tell you that Crows are the happiest among all birds"
Now the crow, realised what is the real happiness. MORAL : Happiness is not about the appearance.